. ‘Wada’s Memory’ magnolia provides plenty of leaves for Michael’s leaf grinding efforts plus some gorgeous fall color. 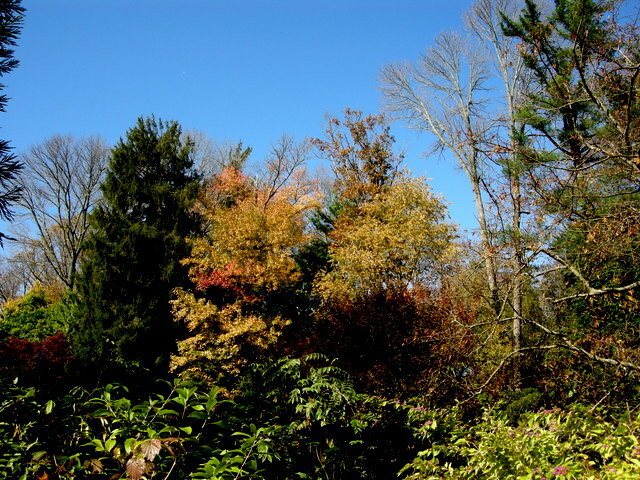 My husband Michael and I have spent 30 years perfecting our gardening techniques at Carolyn’s Shade Gardens, and we are always happy to pass on what we have learned to our nursery customers. 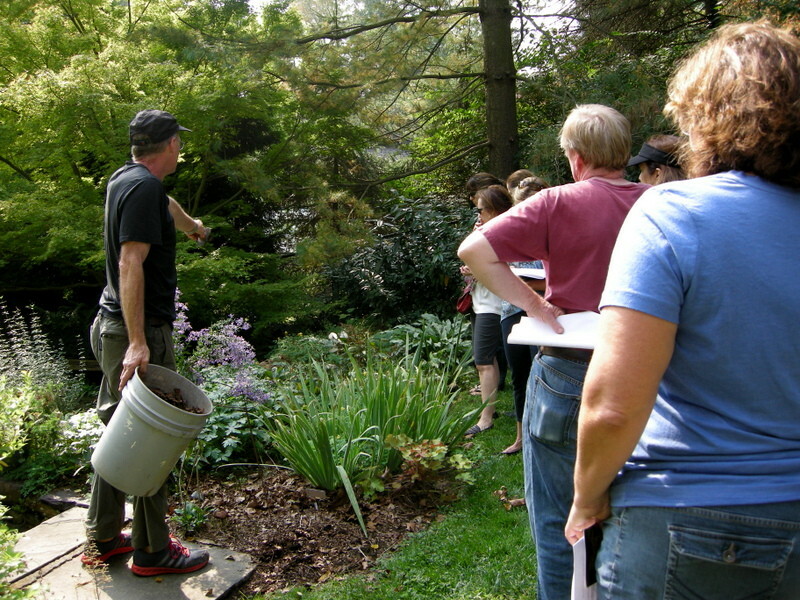 In spring 2012, Michael developed a series of seminars to demonstrate our methods to our customers right here at the nursery. 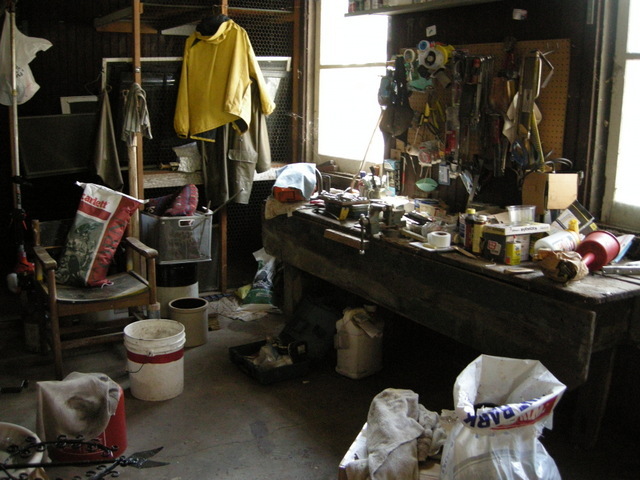 This post is Part 2 of a two part series explaining what goes on at Michael’s seminars. Part 1 detailed the tools that we recommend to make garden maintenance easy. You can read it by clicking here. 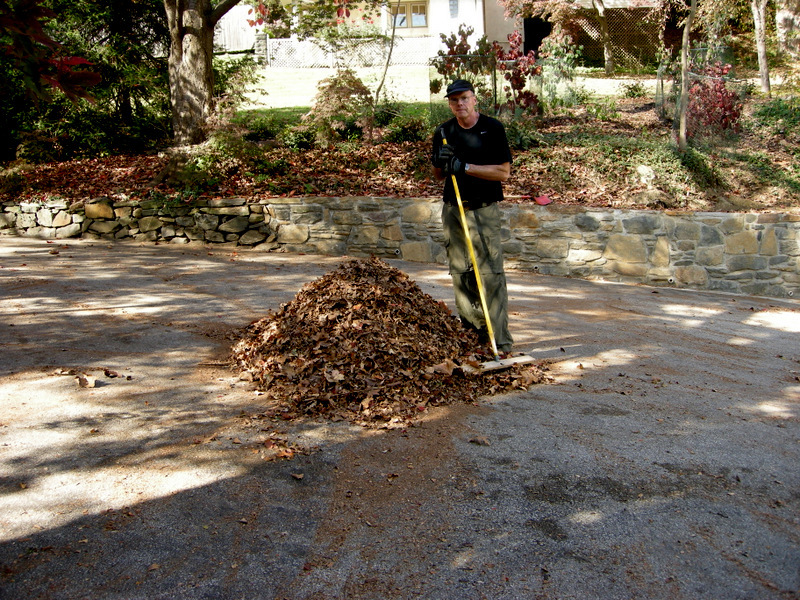 Michael with a typical pile of leaves ready for grinding into mulch. 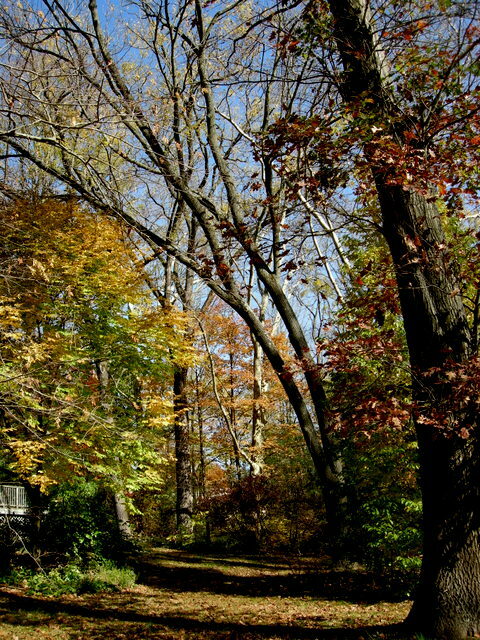 We believe that the most valuable asset on our property is the leaves that fall from our trees. 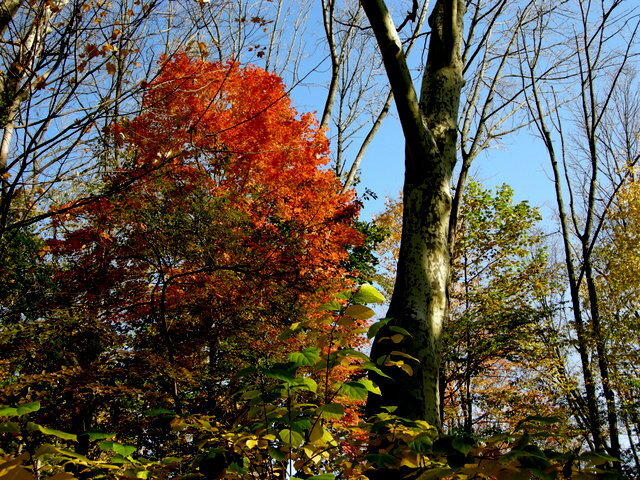 Leaves are what nature provides for free to protect and improve your soil. 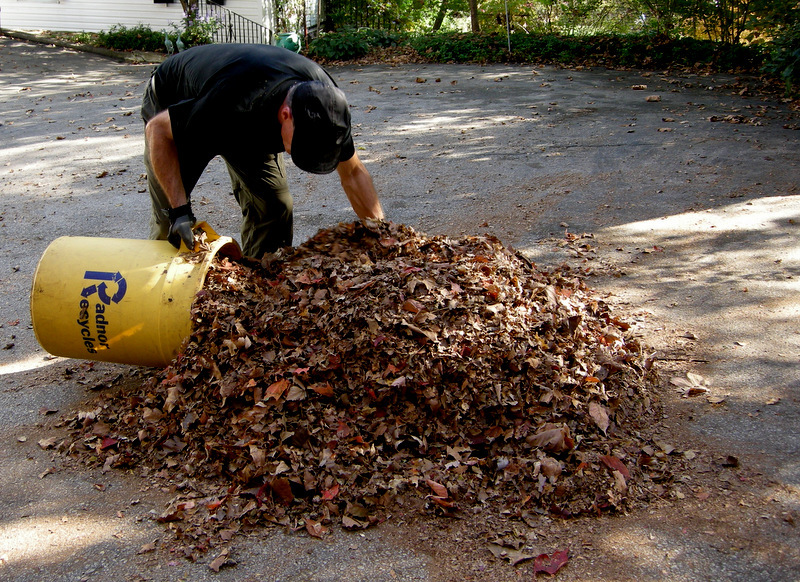 Removing and disposing of your leaves outside your own property is the worst thing that you can do to your garden. During his seminar, Michael demonstrates how we handle the massive quantity of leaves that fall from our 35 plus large deciduous trees. Basically we leave them in place to decompose on their own, grind them on the lawn to help it grow, and grind them into mulch for our garden beds. 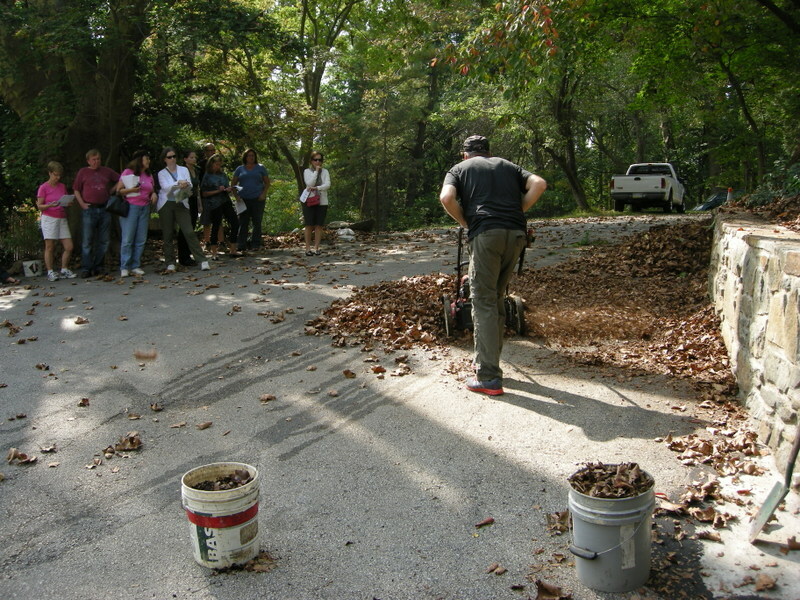 Michael demonstrates leaf grinding to seminar attendees. 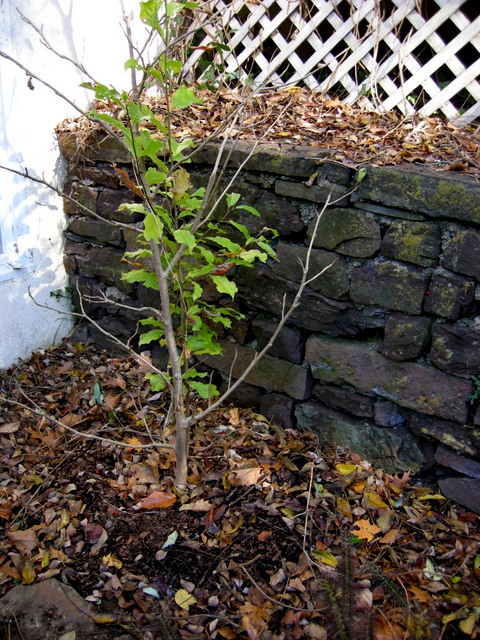 For a step-by-step guide to grinding your leaves to use for mulch, please read my post Your Most Precious Garden Resource by clicking here. For a video by Scotts Lawn Care showing how to grind leaves on your lawn, click here. 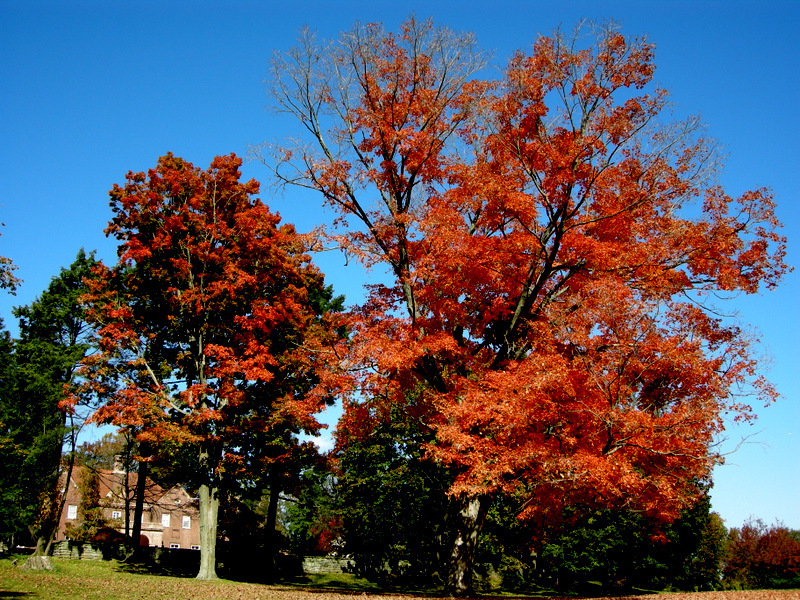 A recent Michigan State University study has shown that grinding up to 18″ of leaves on your lawn and leaving them there is beneficial to your lawn. 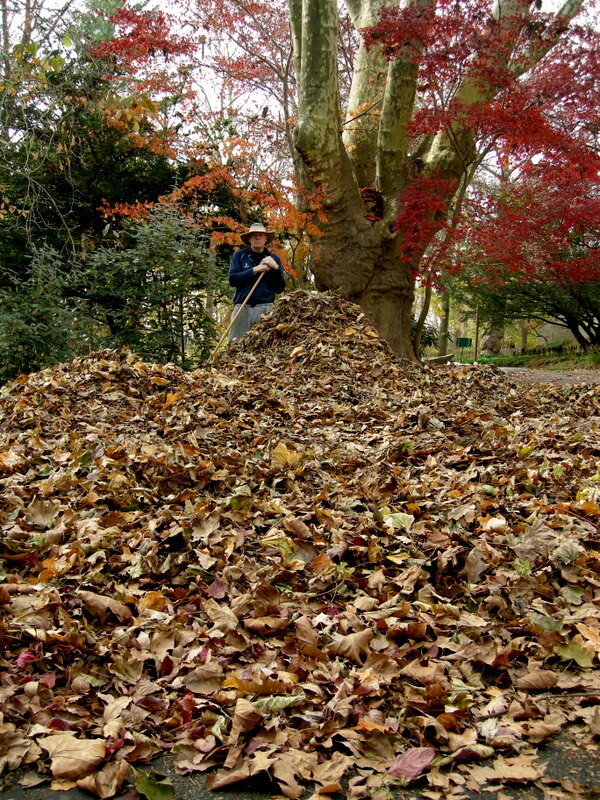 For more information on how we handle leaves in our beds in the fall, click here. Michael demonstrates how he uses the ground leaves for mulch in our gardens. Our other secret weapon is compost, which we make ourselves and also get from the township. No bed is created and no plant is planted without adding a large amount of this “black gold”. 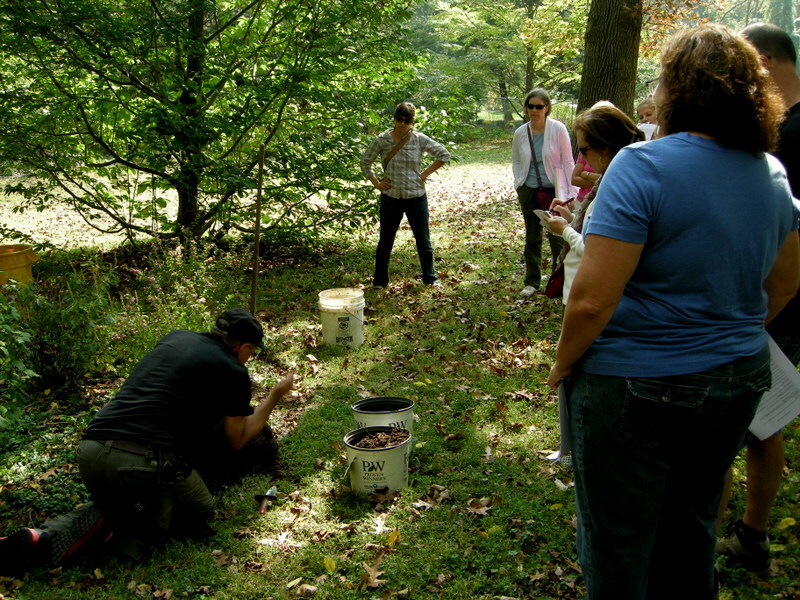 Michael shows seminar attendees what good compost should look like and demonstrates how we go about composting. For more information on how we use compost in our garden, read my post Powered by Compost by clicking here. During the tool session at the beginning of the seminar, Michael talks about what an important tool compost is. 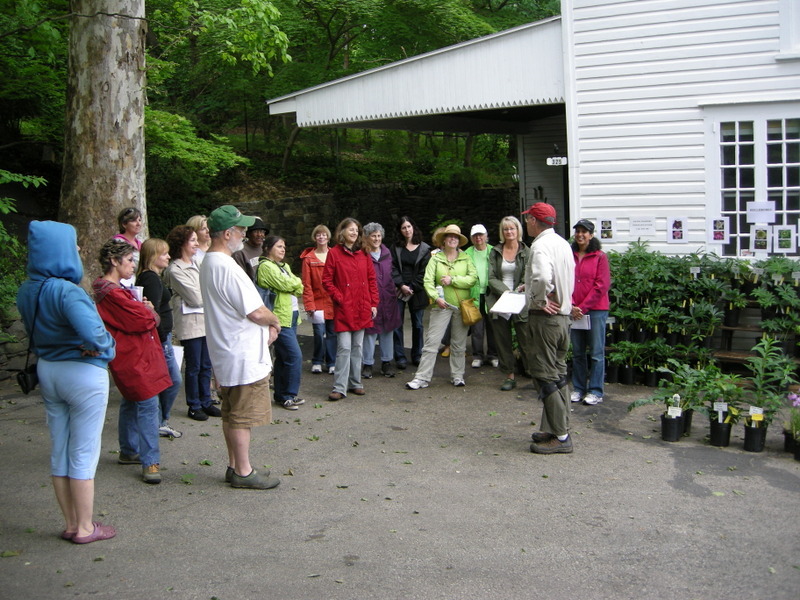 Every seminar includes a trip to our compost area and a demonstration of composting techniques. Many other important gardening jobs are explained in detail with live demonstrations….. Planting a perennial using a shovel or an auger attachment to a drill. Edging beds to keep out weeds and present a manicured look. Planting a shrub, here Michael shows how it is important to loosen the roots on the outside of the rootball. 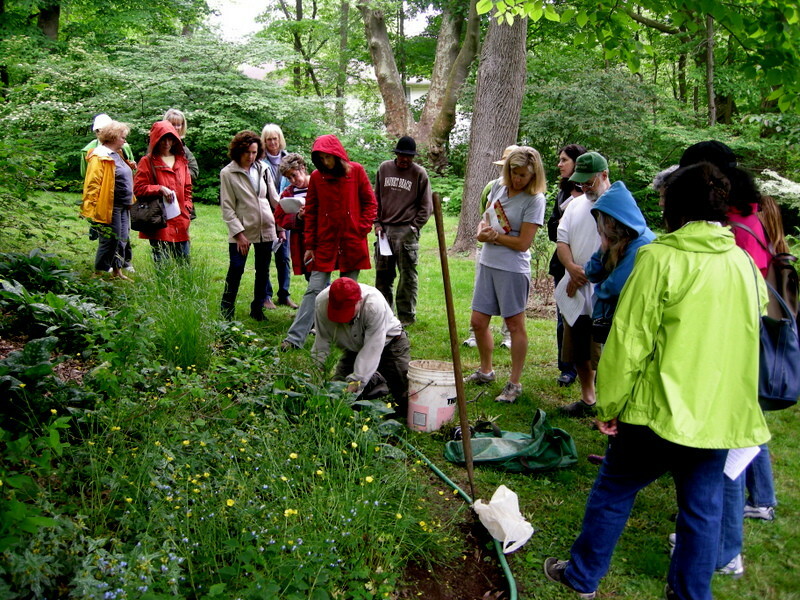 Every session ends with a question and answer period during which attendees can ask about any gardening task that interests them. These are just some of the topics covered in a typical seminar. 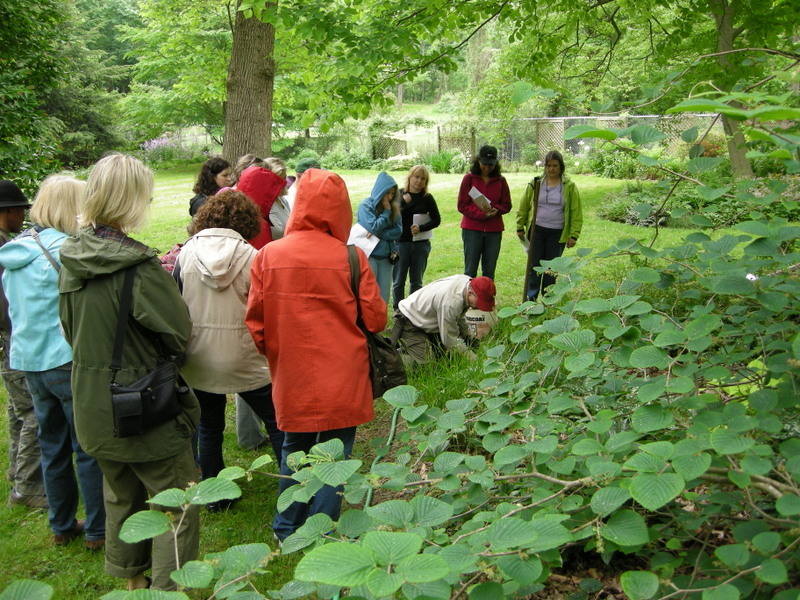 Other subjects include deer management, invasive plant removal, winter interest, container planting, and many more. 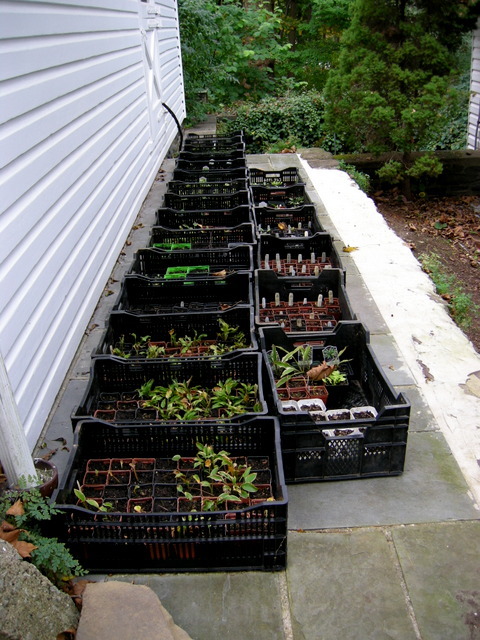 Nursery Happenings: Carolyn’s Shade Gardens is closed for the winter. Please visit my Etsy Shop to purchase photo note cards suitable for all occasions by clicking here. Look for the 2014 Snowdrop Catalogue in early January. 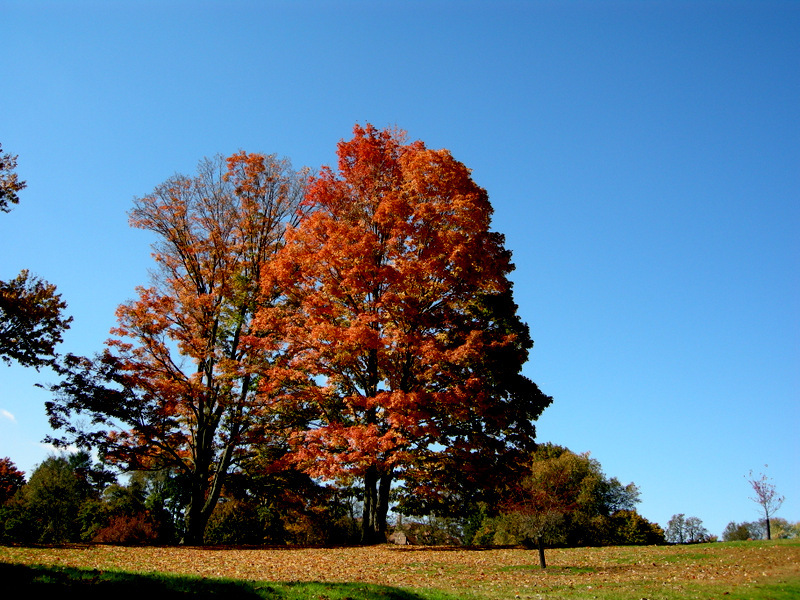 Yes, the sky is really this blue and the trees are really this red during fall in the northeastern US. 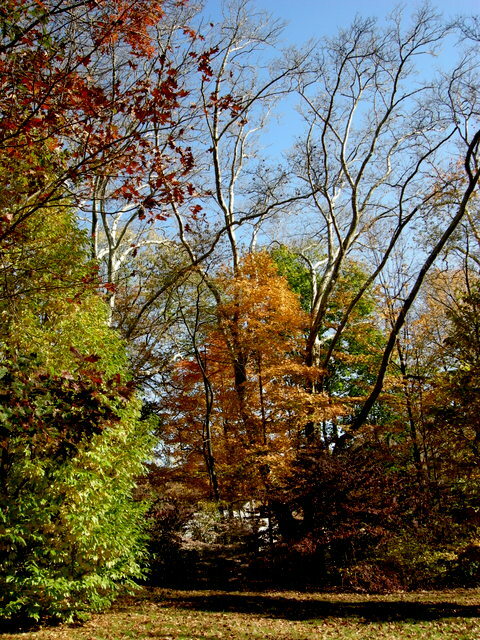 Fall in Pennsylvania (mid-Atlantic US) is a big picture time of year. For a good two months, everywhere you go there are gorgeous vistas like the one above as the leaves change color before dropping. 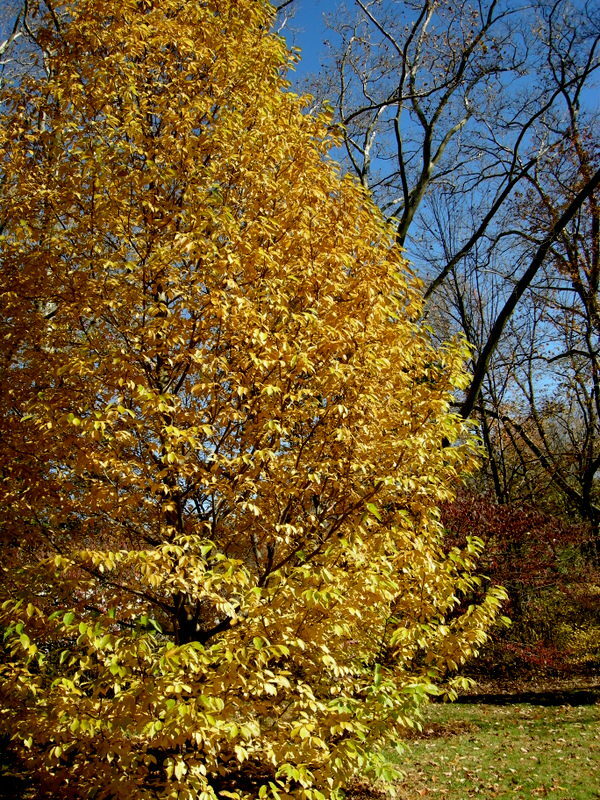 The show is long-lasting because the leaves turn at different times, starting in my garden with the American hornbeam’s golden yellow hue, progressing through the bright red tones of maples and native dogwoods, and ending with the burgundy and orange of hydrangeas and viburnums. 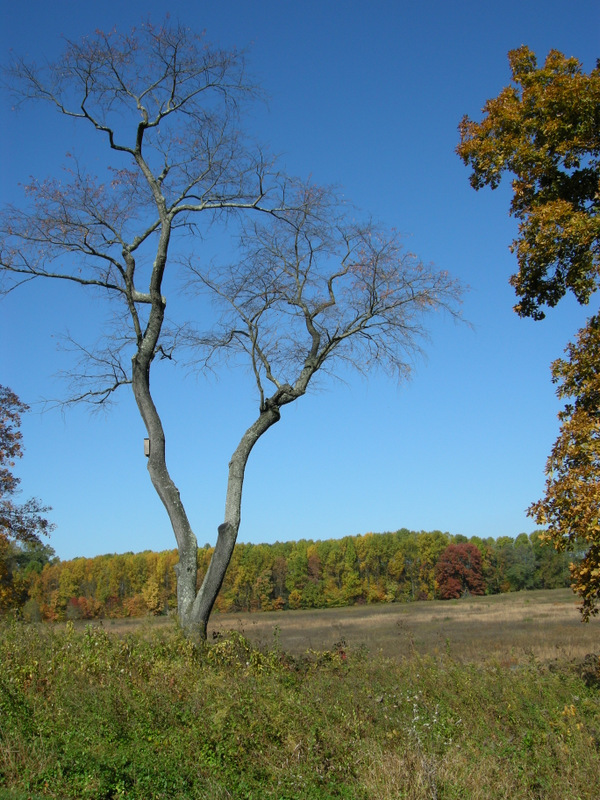 The soil is deep and very fertile in my area, allowing trees to grow to gigantic size. 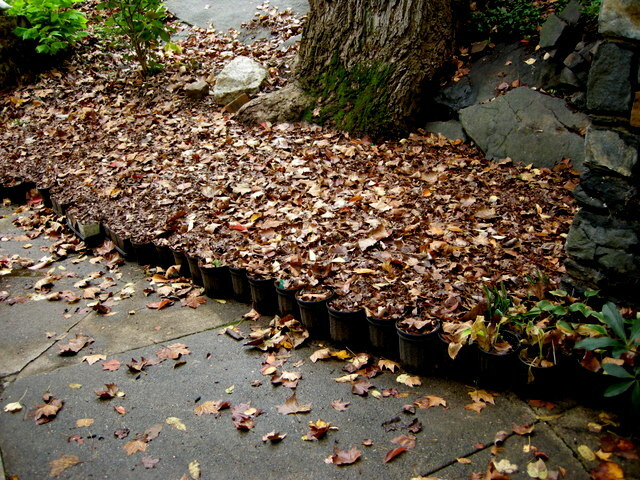 And after the color show, the leaves fall and create what I consider my most precious garden resource. 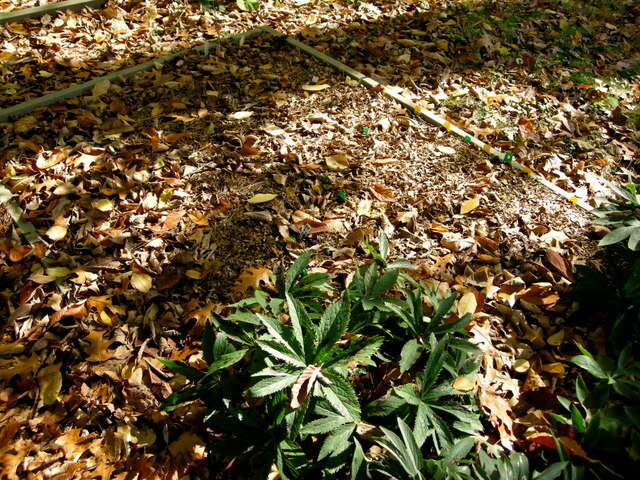 Those leaves are what nature supplies for free to protect and improve the soil year after year. That is why it is so disturbing to see many area residents collecting their leaves and putting them by the side of the road to be removed by their municipality. 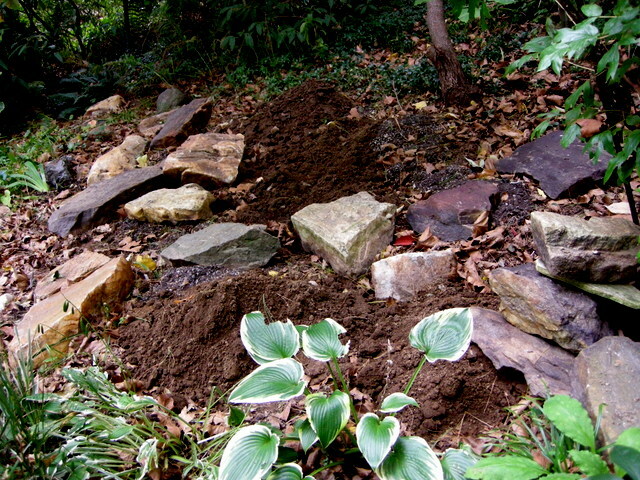 Here at Carolyn’s Shade Gardens we use every leaf that falls to improve our soil either by leaving them in the beds or by grinding them and using them as mulch. 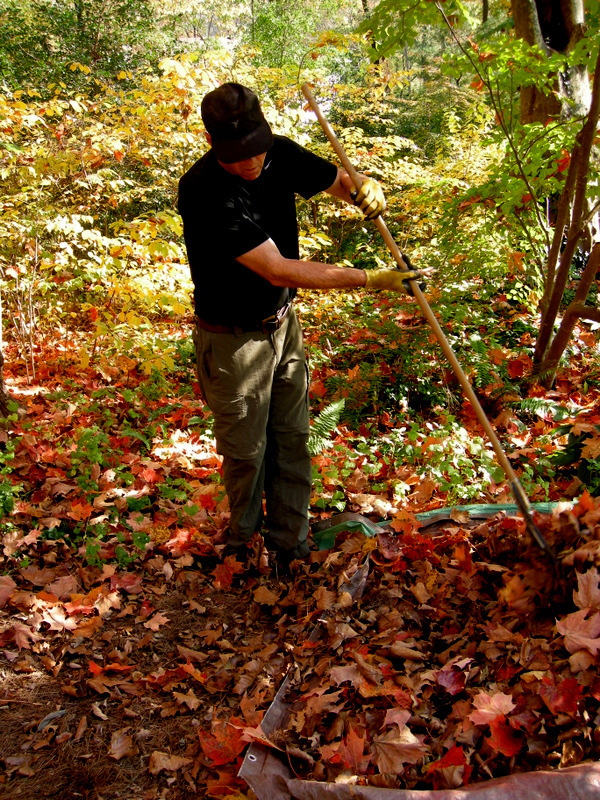 A detailed description of our methods can be found in Shade Gardening in Fall: Fall Clean-up. 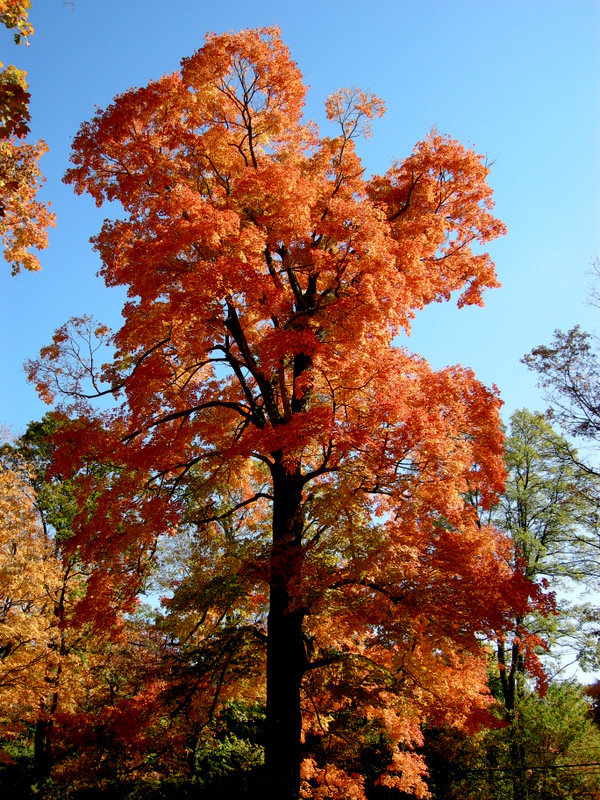 In addition, up to 18″ of leaves can be ground up and left on the lawn with beneficial results as described in Shade Gardening in Fall: Leaves on the Lawn. There is a video by the Scott Lawn Care Company in the second post to show to your doubting spouse. 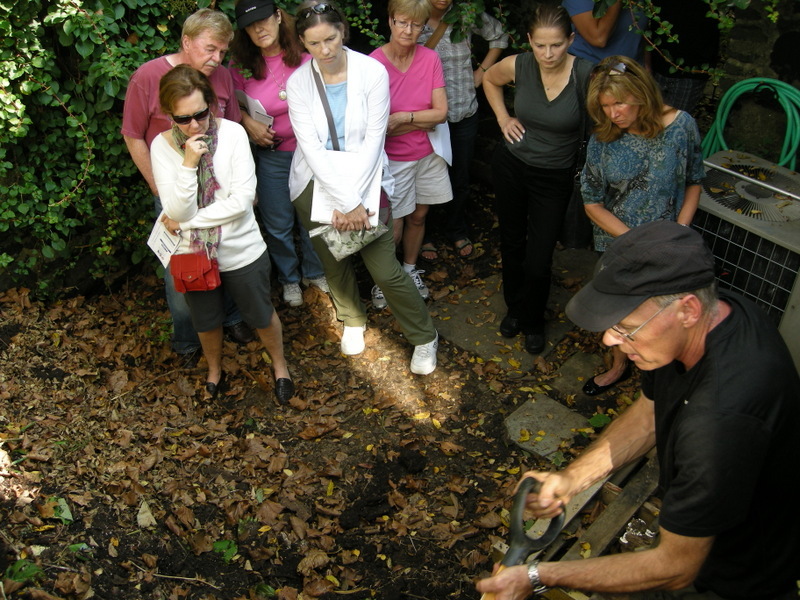 In early October, about 35 Carolyn’s Shade Gardens customers attended two Low Maintenance Gardening Seminars given by my husband Michael during which he demonstrated how to grind leaves for mulch. For the benefit of my far flung readers and in the hope of converting more gardeners to this practice, I thought I would show you step-by-step photographs of the process. Michael is the reluctant star of the do-it-yourself guide below. Step One: Gather the leaves from an area where they can’t be left to decompose on their own. 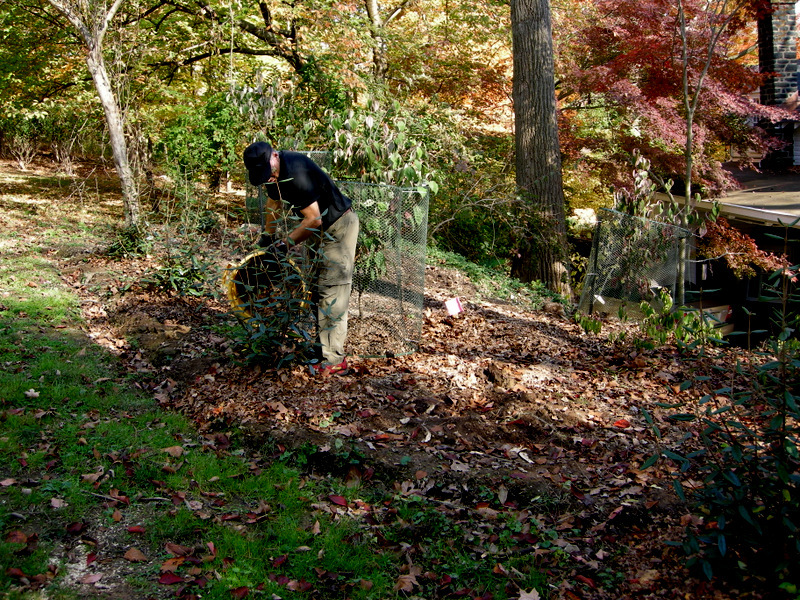 Michael is removing leaves from the pine needle paths on our back hill using a tarp. 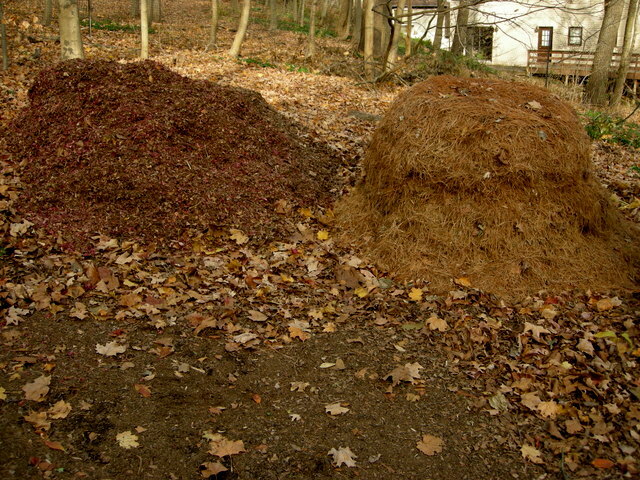 All leaves in the beds will remain in place as mulch and eventually compost. 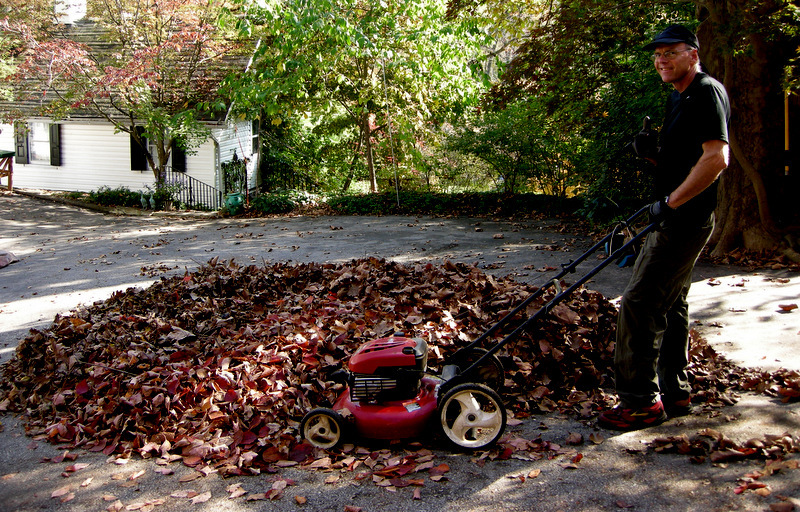 Step Two: Take the leaves to a level area like your lawn or driveway. 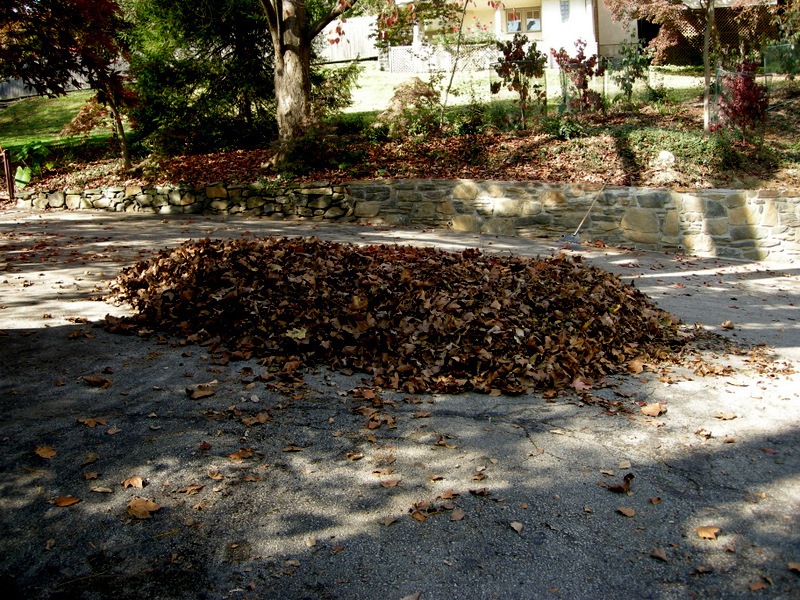 Our driveway is closest to the back hill so Michael took the leaves there for grinding. As you can see in the photo, we use a standard lawnmower to grind our leaves. We recommend wearing steel-toed footwear, ear protection (see photo below), and, if appropriate, eye protection when using a lawnmower. Step Three: Grind the leaves to the required consistency. Michael usually goes over them twice, but you can make them as fine or as coarse as you want. 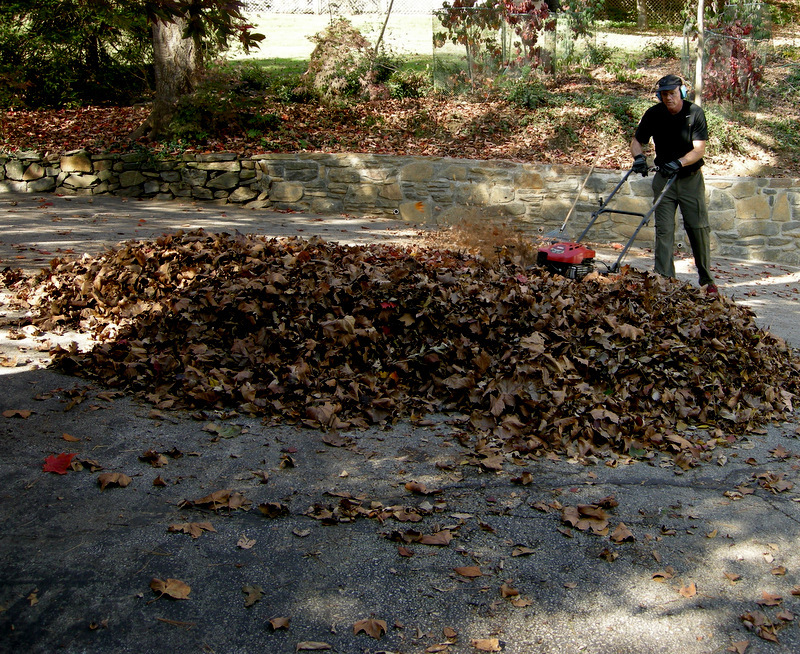 A large amount of leaves becomes a manageable pile after grinding. 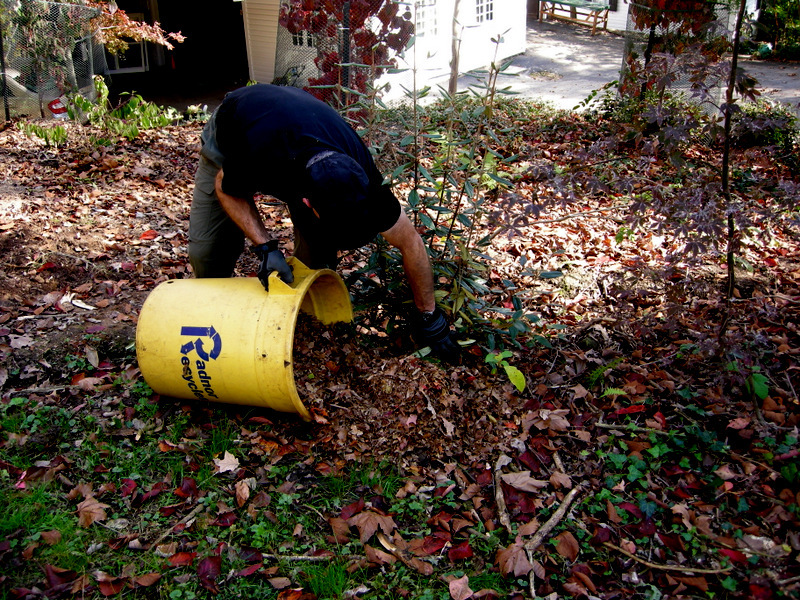 Step Four: Gather your free mulch into a container for easy transportation and application. Michael is using a township recycling barrel. 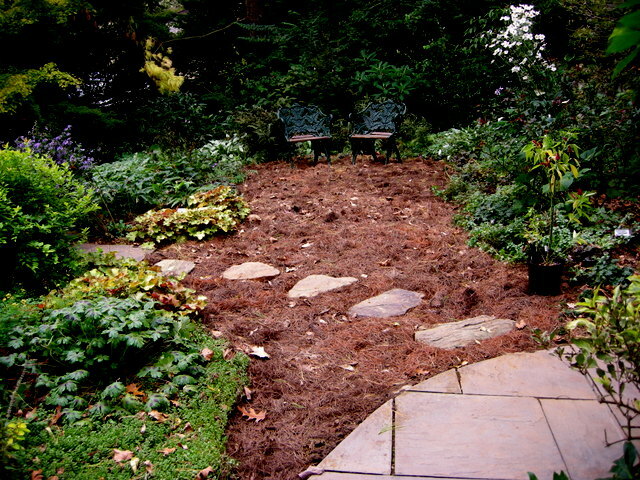 Step Five: Spread the mulch in your garden. Here Michael uses it around the base of newly planted viburnums. I hope I have made this process look as easy as it really is. Once you try it and see the beneficial results for your soil, you too will be a convert.